The product team designed this module to have two different image crops, one for mobile and one for desktop. Some modules on our site also have a specific crop for tablets, so it’s important for us to be able to optimize images across all devices. 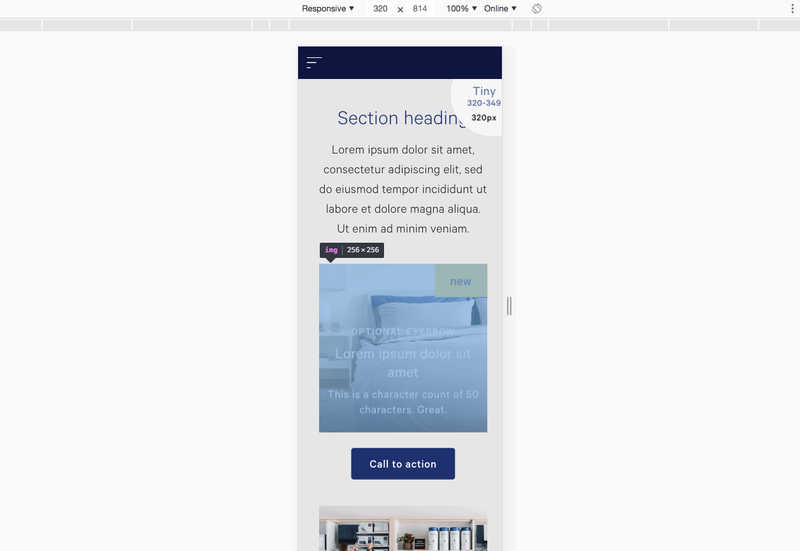 In my first pass at this module, I was rendering images that were much bigger than they needed to be, which adds a risk of increased page load times. The HTML <picture> element serves as a container for zero or more <source>elements and one <img> element to provide versions of an image for different display device scenarios. The browser will consider each of the child <source> elements and select one corresponding to the best match found; if no matches are found among the <source> elements, the file specified by the <img> element's src attribute is selected. The selected image is then presented in the space occupied by the <img> element. In this case, if your browser is at least 1000px wide, you can see an image of a surfer with one set of dimensions. If it’s 999px wide or below, you see a different image with different dimensions. We use similar logic to display images of different crops and sizes at different browser breakpoints. We incorporate this logic into React components. Based on what we know about how the picture element works, every time the page either loads for the first time or the browser width changes, the picture element should check each source element to see if one is a match. If it finds one, it uses it. If it doesn’t, it uses the img fallback. As you can see in the code above, the values for srcSet, sizes, andmedia all come from each object inprops.config. Let’s trace how this prop is passed using the ContentModule (shown at the beginning of this post). You may have noticed that we’re not specifying a value for quality here. In our srcSet util, quality is optional, and we have a default quality of 65 set. Your image config can consist of either an array of objects or a single object. Each object represents a different image crop. In our example of thecontentImageConfig, we have two crops, one for mobile and one for desktop, where the paths for the crops (imagePathMobile and imagePathDesktop) are data values passed in from our CMS. When the image config is an array, the ResponsiveImage component renders a picture element. When the image config is a single object, it renders an img element. Next we have the sizes key. This key is read from right to left, in increasing order of screen size. The value furthest right with no screen size is the default value for this config object. So in the case of the first object, which has the mobile image path ("products_new/nap-pillow/test-mobile-single.jpg"), the default width of the image is 81vw. Then starting at a width of 560px, the image has a width of 88vw. The min and max keys are pixel values for images in this range (determined by the max-width value in the media key). The image width is 256px. In this case, the image gets bigger as the screen gets wider, so we can set this as the minvalue. (In some cases, the image might get smaller as the screen gets larger. This means we can't always set the min to the width of the image at the low end of the range.) Now we can get the default value in vw, or the rightmost value in the sizes key, by dividing the image width by the screen width: 256 / 320 = 0.8. So why is the default set to 81vw? You’ll notice we don’t update the vw again until we hit a min-width of 560px. Before that point, the width of the image only changes slightly. At 504px, the width of the image is 408px. 408 / 504 = 0.81. This is a small enough difference that we don’t need to create a separate rule for it in the sizes key, and can just tell our smallest screen size to render a slightly larger image than it needs. 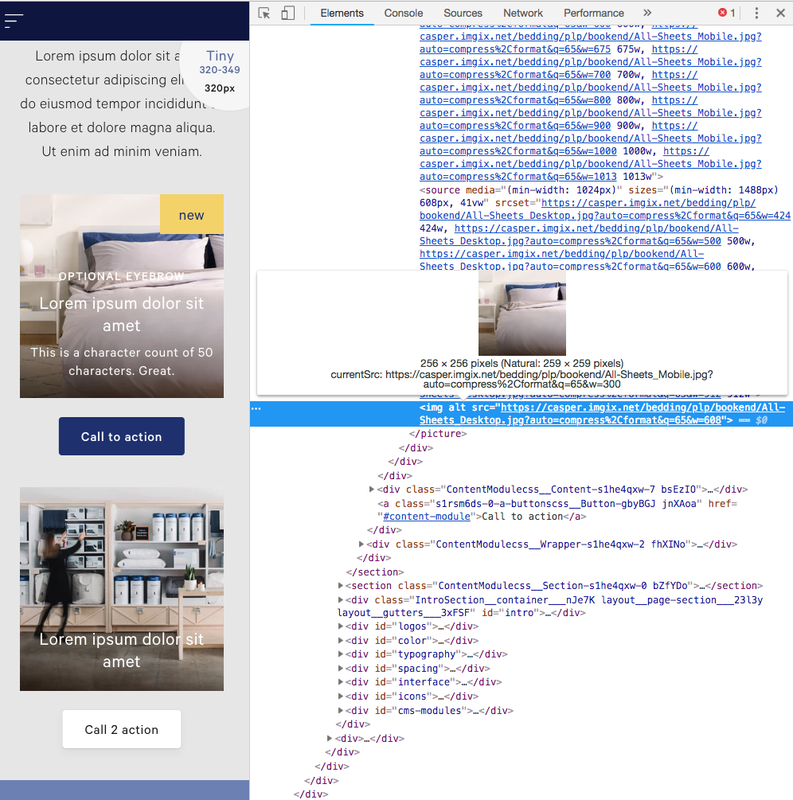 After mobile portrait, our next set of breakpoints is mobile landscape (560px to 767px). To get vw for the minimum width of 560px, check various sizes between 560px and 767px to determine the largest percentage of the screen the image takes up. In this case, it was 0.88, for 88vw. Next, let’s figure out the max value. Instead of just writing the maximum pixel amount, multiply the highest vw amount in the sizes key by the maximum screen size. In this case, the maximum screen size is 767px. This object has a max of 1232px. In the sizes key, we can see that starting at a screen width of 1488px (determined by trial and error), the image is 1232px wide, and never gets wider, so we can hardcode the px value in the sizes key and put the pixel value in the max key. If you want to optimize for retina displays, there’s an added consideration related to the maximum size of your image. Casper’s ResponsiveImage component, for example, handles this by using a util that determines the maximum width of the image by multiplying the max value passed in the image config by 1.5. This means the width of the image asset should be at least 1.5x the width passed in the max key. 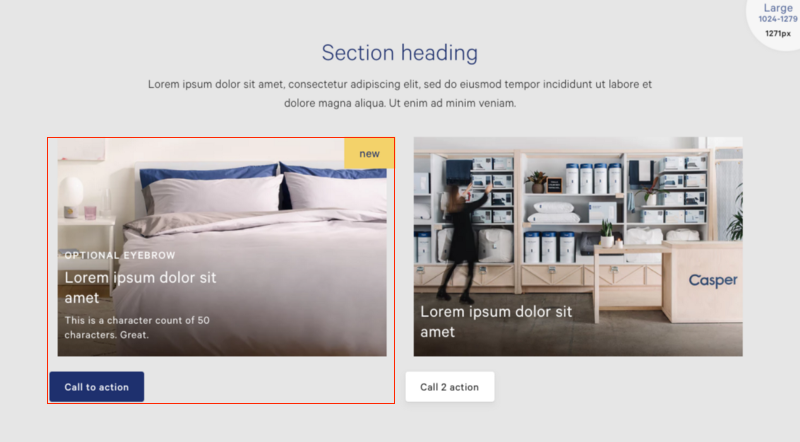 Finally, for images that are a fixed width, like a thumbnail, you can omit the max value. Note that the width will usually be rounded to the nearest hundred, so for a screen width of 320px, 256px will be rounded to 300px. The only time the width is not rounded is if an image width for a breakpoint is given in pixels. As you can see, the “new” badge in the upper right corner and the button in the lower left corner look misaligned because the image isn’t quite wide enough. And that’s it! Now that you know how to read, write and test image configs, you can optimize your images and cut down on page load times. Shout out to Joseph Cortbawi for sharing his vast knowledge about responsive images with me! If you’re interested in learning more about how we tackle the day-to-day challenges of building an e-comm site, check out our jobs page for opportunities to the join the team. We’re always looking for talented engineers to help us bring Casper to the next level. Thoughts and feelings from the tech team at Casper Sleep.